UPDATED: Wed., Oct. 31, 2018, 9:05 p.m. 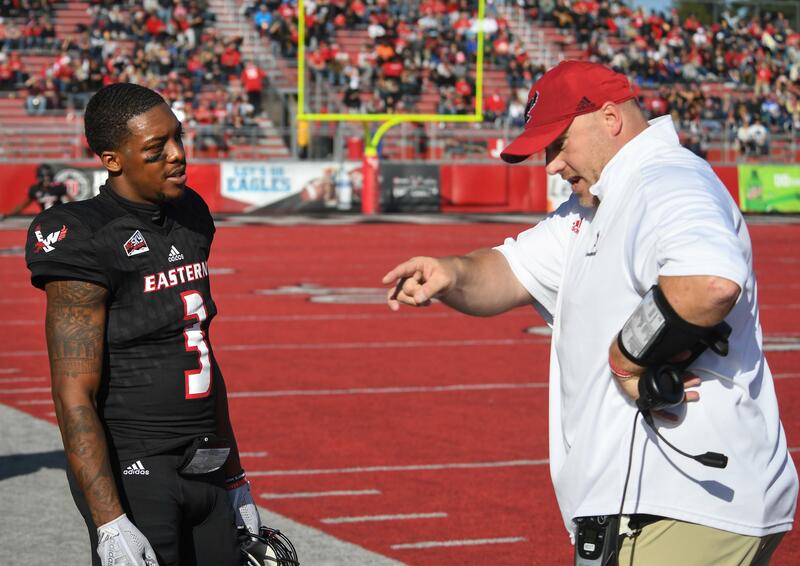 Whether it’s in casual conversation or the moments following one of his electric touchdown runs, Eastern Washington quarterback Eric Barriere is smiling. The sort of contagious, ear-to-ear grin that even follows a missed throw or bad read, a positive approach that often leads to next-play atonement. The sophomore from Inglewood, California, had a reason for the upbeat attitude last Thursday. Barriere, who had filled in the last three games for injured All-American senior Gage Gubrud, learned that he would be the Eagles’ primary quarterback going forward, as Gubrud would pursue career-ending surgery. His heart sank for Gubrud, but this is what he’d been waiting and preparing for since he was three-star recruit coming out of La Habra High School. Barriere, one of the top high school recruits EWU has signed, handled the news accordingly. Now he’s tasked with getting the fifth-ranked Eagles (6-2, 4-1) at least a share of the Big Sky Conference crown and an FCS playoff berth in a pivotal three-game stretch. When Barriere is taking snaps Saturday at Northern Colorado (2-7, 2-2), he’ll no longer be the temporary solution. This is his offense now, and likely the next two seasons. Welcome to the EB3 era. “So much talent. He’s got a long ways to go, from a leadership standpoint and a knowledge standpoint of the game and the system,” Gubrud said of Barriere. “But you watch that guy play, and the speed that he plays with, it’s really impressive. In wins against Southern Utah and Idaho this season, Barriere completed 42 of his 63 passes for 559 yards and four touchdowns. He was also menacing on the ground, rushing for 168 yards and three touchdowns on 17 carries. His shifty, crowd-pleasing 85-yard touchdown run against SUU was a viral hit in FCS football circles, and was the longest touchdown run for a quarterback in program history. The same EWU football program produced star Vernon Adams, a fellow Southern California product who wore the same jersey number and had similar skills. But does replacing Gubrud – one of the top FCS QBs in the country – with a player with only four career starts put a ceiling on EWU’s season? Barriere earned his first collegiate start as a freshman last season at struggling North Dakota, in place of Gubrud, who served a one-game suspension due to a violation of team rules. He played conservatively, he said, finishing with 130 passing yards and 50 yards rushing in a 21-14 win. Barriere is 3-0 against teams under .500 (Idaho, Southern Utah and North Dakota in 2017). He struggled in his lone start against a Top 25 team, Weber State. Fourth-ranked Weber State’s staunch defense limited Barriere to 19-of-42 passing for 185 yards, sacked him four times and intercepted him twice. The Eagles’ 14-6 loss in Ogden, Utah, was the first time EWU didn’t score a touchdown since 2008. He kept smiling, though, and bounced back convincingly, spearheading the Eagles’ offense in the 38-14 rout of Idaho, a game in which Barriere looked like the star he was at La Habra High. Barriere threw for 7,586 yards and 104 touchdowns at the Orange County school, and also ran for 26 TDs while leading La Habra High to a 30-8 record. During his senior year, the Orange County Register rated Barriere the area’s third-best quarterback, behind KJ Kostello and Devon Modster, two QBs who’ve since started games at Stanford and UCLA, respectively. Former EWU star and current Los Angeles Rams receiver Cooper Kupp has also been impressed with Barriere. Former Battle Ground High star Gunner Talkington, the co-offensive scout team player of the year at EWU last season, is now the Eagles’ No. 2 quarterback. The redshirt freshman has completed 3 of 6 passes for 35 yards. Published: Oct. 31, 2018, 6:27 p.m. Updated: Oct. 31, 2018, 9:05 p.m.